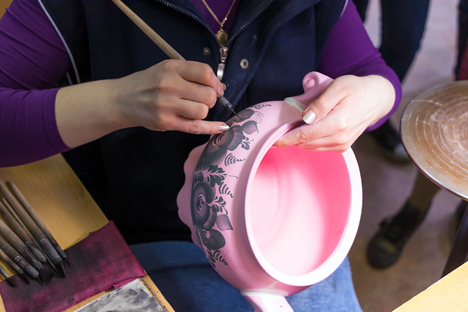 Where do foreigners go to learn well-known Russian traditional folk crafts, many of which are centuries old and cannot be found elsewhere? RIR finds out. Foreigners can learn the methods of painting miniatures by doing an internship at the M. Gorky International School of Palekh, located in the old Russian village of Palekh in the Ivanovo Region, about 435 miles northeast of Moscow. The school teaches the old technique of exquisite lacquer painting. Brooches, caskets, coffers, ashtrays and other such articles are painted in gold and tempera - natural colors diluted in egg yolk. The originality of this art lies not only in its technique, but also in the drawings' subject matter: They always depict Russian fairytales, songs or byliny (oral epic narrative poems). Since Palekh is also an old center of Russian church painting, the school teaches icon painting too. According to School Director Mikhail Belousov, a typical day at the school consists of eight hours of instruction, but the conditions and terms of the internship are determined on an individual basis and depend on the student's objectives. There are two main requirements: proficiency in the Russian language and training in the arts. Address: Ivanovo Region, Palekh, 18 Shuiskaya Street. Palekh miniature painting appeared in the village of Palekh in the first quarter of the 20th century as a decorative branch of the local art of icon painting, which had flourished in the village thanks to many workshops. As in later miniature painting, it was characterized by subtle filigree script, gold and tempera paints. The craft that made Vologda famous throughout the country - the weaving of subtle lace on wooden needles and bobbins - is still taught in the old city at the Gubernatorial College of Folk Crafts. According to one of the teachers, Oxana Kirillova, an embroiderer must have patience and perseverance because this is not one of the easiest art forms to master. Students learn composition, technical drawing, and practice the art itself along with other disciplines. The academic calendar is divided into four-month courses with the main program of study designed for three years and ten months. Oxana Kirillova says that foreigners have never studied at the college, but it is possible if you know some Russian. Address: Vologda, Kozlyenskaya Street, 117. Vologda became a center of embroidery at the end of the 18th century along with several other Russian cities where peasant workshops were operating on noble estates. There the serfs would create very subtle embroidery for the finishing of their masters' dresses and linen. Gradually, the craft evolved and the products became available within the folk communities. Because of the complexity of the process, the numbers of masters able to weave lace are currently shrinking. Gzhel is a folk art that appeared in the 18-19th centuries in villages outside of Moscow. According to the technique, objects are made of clay, fired in a kiln, adorned with cobalt paint and then covered with glaze. The Gzhel State Art and Industry Institute not far from the village of Gzhel offers academic programs on creating crockery sets and other decorative objects. The program at the Folk Arts and Crafts Faculty lasts four years and includes the basics of painting, modeling and decorating artistic ceramics and pottery, as well as other disciplines. Foreigners wishing to enroll must be proficient in the Russian language. Tuition costs 118,000 rubles (just above $3,000) a year. Gzhel is a district of 27 villages famous for the extraction of various types of clay. At the beginning of the 19th century the locals began producing coarse earthenware. Then the peasant Kulikovy brothers developed a white faience and in 1800-1804 the first porcelain factory was established, which launched the production of Gzhel. By the 1830-1840s almost half of Russia's earthenware and porcelain enterprises were concentrated in the district.